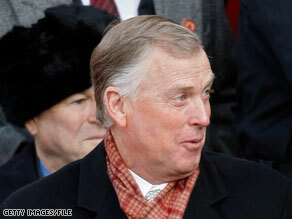 Dan Quayle's son announced Friday his intention to run for Congress. (CNN) – Dan Quayle's son is running for Congress. Ben Quayle announced Friday that he will seek the Arizona House seat being vacated by retiring Rep. John Shadegg. "My generation is going to have to clean up the mess made by the politicians in Washington," Quayle said in a statement. "The reckless spending and crushing debt burden must be stopped." According to the statement put out by a spokesman, the younger Quayle is managing director of Tynwald Capital, "a firm specializing in the acquisition and nurturing of small business." Why not...don't have to be smart and look, the money rolls his way!! Hope he can spell potato. The son of the worst VP ever??? How bad will things really get??? They just did!!! "I knew Jack Kennedy. Jack Kennedy was my friend. And you're no Jack Kennedy." Dems need to be doing a lot more of that these days! "May our nation continue to be the beakon of hope to the world." - The Quayles' 1989 Christmas card. Maybe Ben is the Republican Party's next beakon of dope. Let's hope Ben got his mother's brains. His dad is certainly as dumb as a post. He sounds just as conservative, and just as stupid, as his father. His generation? How old is this dude? I hope he is better trained than his dad. Well, with Obama in the White House, there are zero standards of intelligence anyway. "Corpse-man"? For a medic? In a prepared speech? At least Bush's "nucular" was only embarrassing, and not insulting. Just another sign of the Apocalypse. Heck, anybody would be better than the ignorant liberals that are in place now, who have no inkling how to manage anything. I guess it's OK for anyone named Kennedy to run for office, regardless of how unqualified they are, but not the son of a Republican. I say this is fantastic news. I hope he wins. The world needs some fresh Quayleisms. His Father's were getting kind of stale, since so many people misquoted him trying to turn his Quayleisms into Bushisms.